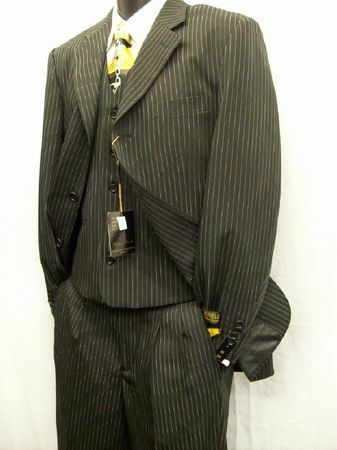 Who doesn't like the way a man looks when he is wearing a good fitting black pinstripe three piece suit. There is something very regal about pinstripe pattern fabric type that just seems to work especially in a three piece suit with a vest. Umberto Bonelli just so makes a black pinstripe three piece suit that feature an affordable price and look really nice not just on the hanger but on you as well. This black pin stripe by Umberto Bonelli three piece suit has three button jacket and is made of a textured pinstripe Poly Gabardine Fabric. Final Sale.